Renee Hobbs at Temple University has been instrumental in putting an end to copyright confusion for educators and students. Hobbs work brings clarity and understanding to how fair use supports digital learning. Her work was instrumental in helping educators gain better understanding and clarification in Fair Use for Media Literacy. 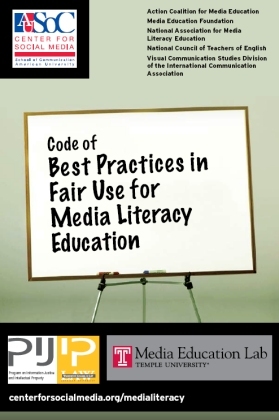 November 11, 2008 marked a new day in clarity and understanding when the National Constitution Center released the The Code of Best Practices in Fair Use for Media Literacy Education (pdf)! Make copies of newspaper articles, TV shows, and other copyrighted works, and use them and keep them for educational use. Create curriculum materials and scholarship with copyrighted materials embedded. Share, sell and distribute curriculum materials with copyrighted materials embedded. Use copyrighted works in creating new material. Distribute their works digitally if they meet the transformativeness standard. The limitations and circumstances are explained more fully in the report. Five different attorneys reviewed the work and it has already been endorsed by the National Association for Media Literacy Education, the Action Coalition for Media Education, the National Council of Teachers of English, the Visual Communication Studies Division of the International Communication Association, and Media Education Foundation. The code was facilitated by Peter Jaszi and Patricia Aufderheide of American University, and Renee Hobbs of Temple University. Jamie Bischoff, partner at Ballard Spahr, copyright attorney quoted the Chicago Manual of Fair Use…This right of fair use is a valuable one to scholarship and it should not be allowed to decay through the failure of scholars to employ it boldly. The most radical thing in the code, she suggested, is the suggestion that educators CAN figure out…not that any use you want to make is not a fair use, but there are a lot of rights in educational context that rely don’t need to be cleared….Fair Use is a RIGHT, that we WILL lose it if we don’t continue to employ it boldly, actively and in good faith! Fair use doctrine has become more important especially as we embrace a new way of thinking of fair use ANALYSIS…not just following “guidelines” and deciding whether new use that is being undertaken is or is not transformative. That if copyrighted material is used it both adds value to what was taken and repurposes it-offers for a different end or goal. The other pillar was that when use communities speak…the courts listen! Consistently over time if a court wants to know if a given use of unlicensed material is or is not fair they look to the use community in which that use occurred. Peter also talked about the guidelines that are what most folks follow when they think about using copyrighted materials and are quite contrary to the statement they presented, as a “trap for the unwary”. While they are well intended to create minimum safe harbors, are inadequate in scope and are often misrepresented by copyright owners and misunderstood by educators as representing outer limits. The Code of Best Practices is designed to demonstrate that your rights as educators and learners will make clear that fair use is dynamic, living and should not be defined to a rule book! Pat Aufderheide who did her work with the documentary filmmakers reminded us that in order to have creativity in education we need to have conversations with the “gatekeepers” to get them beyond the rigid guidelines where folks can assert their rights… and Kathy Im from MacArthur foundation came to discuss how MacArthur Foundation is supporting the work because of the desire to keep a balance and reclaim the ORIGINAL INTENT of Fair Use. Fair use has been misconstrued for some time. Participation in digital environment is widespread. Students are different and the interest is to have them build the capacity of a CRITICAL EYE!!!! Joyce Valenza described how her kids and teachers WANT to be TRANSFORMATIVE, but that there is a MAJOR disconnect between what her kids put up on YouTube and Facebook and what they will put ups as a school because of the strict “guidelines”. Before this release, she felt uncomfortable posting on school server some work that is clearly transformative, but now her real work begins-informing people about what transformativeness really is. Rhys from The Media Spot talked about the importance of critical decision making in fair use. Sherry Hope Culver talked about how important the document is and how useful it will be in classroom settings. WE CAN make the changes now with this support. The slide show that was used in the presentation claimed, the END to Copyright Confusion, but it is also a new beginning… the FIRST STEP towards understanding. Educators need to step up and start to talk about it. We need to stop feeling threatened by the so called rules and reclaim our rights under Fair Use teaching teachers and students to think critically about their use of any materials in creative ways. Today, some educators mistakenly believe that the issues covered in the fair use principles below are not theirs to decide. They believe they must follow various kinds of expert guidance offered by others. In fact, the opposite is true. The various negotiated agreements that have emerged since passage of the Copyright Act of 1976 have never had the force of law, and in fact, the guidelines bear little relationship to the actual doctrine of fair use. Sadly, as legal scholar Kenneth Crews has demonstrated in The Law of Fair Use Guidelines, The Ohio State Law Journal 62 (2001): 602-700, many publications for educators reproduce the guidelines uncritically, presenting them as standards that must be adhered to in order to act lawfully. Experts (often non-lawyers) give conference workshops for K-12 teachers, technology coordinators, and library or media specialists where these guidelines and similar sets of purported rules are presented with rigid, official-looking tables and charts. At the same time, materials on copyright for the educational community tend to overstate the risk of educators being sued for copyright infringement and in some cases convey outright misinformation about the subject. In effect, they interfere with genuine understanding of the purpose of copyright to promote the advancement of knowledge through balancing the rights of owners and users.In fact, this is an area in which educators themselves should be leaders rather than followers. Often, they can assert their own rights under fair use to make these decisions on their own, without approval. In rare cases where doing so would bring them into conflict with misguided institutional policies, they should assert their rights and seek to have those policies changed. More generally, educators should share their knowledge of fair use rights with library and media specialists, technology specialists, and other school leaders to assure that their fair use rights are put into institutional practice. The media lab has some great case studies and teaching materials that you can use right away. I say whether it clarified or muddied the water, you can non deny that the need to think critically and to teach our students to view material with a critical eye. US Digital Literacy encourages everyone to download the statement, listen to the recording, JOIN THE WIKI and become advocates for their educational rights under fair use.